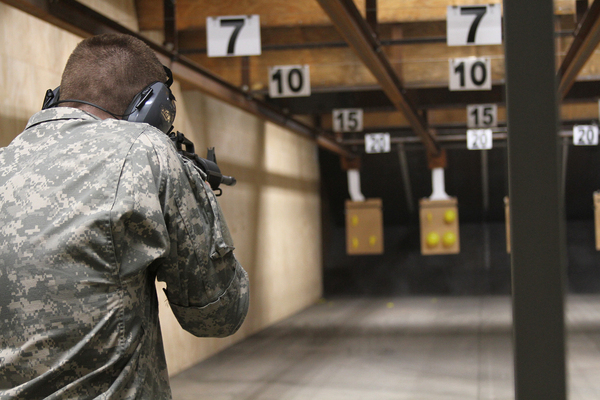 Stephen F. Austin State University's Army ROTC marksmanship team honed their skills during the second annual Battle of the Piney Woods Shootout. SFA's cadets competed in three events: Bull's-eye, Alt-C and Team Shooting. Stephen F. Austin State University's Army ROTC marksmanship team had the opportunity to hone their skills during its recent participation in the second annual Battle of the Piney Woods Shootout at the Meadow Ridge Archery and Gun Range in Nacogdoches. SFA's marksmanship team, comprising eight members and two alternates, competed in three events: bull's-eye, where the cadets attempt to hit their target as accurately as possible; Alt-C, an event where the cadet attempts to score 40:40 on a target with 10 silhouettes; and Team Shooting, where the team has three minutes to hit 32 balloons in a specific sequence. According to second-year team member Cadet Nathan Foy, participating has allowed him to expand his skills while adding variety to his list of targets. "In both practice and competition, we shoot balloons and targets, which is not something I had done prior to joining the team," Foy said. The idea of establishing the Battle of the Piney Woods Shootout began with SFA's marksmanship team wanting to showcase their abilities in a friendly competition. "Many ROTC cadets are really competitive, so this team just adds to our competitiveness," Cadet Tacy Caffey said. "It provides a venue to compete against our rival university."